This book is number 90 in Osprey's Duel series where they take two opposing forces and compare/contrast them. The two subjects are the Imperial Japanese Navy's submarines verses the US Navy's destroyers. The book explains the develop of both these forces before the attack on Pearl Harbor, then goes into greater detail of the next 13 months of fighting until the end of 1942. The book starts with a four-page introduction detailing Japanese developing submarine tactics of using their force to attack US Navy capital ships in a war of attrition leading up to a decisive grand battle between the fleets. They developed large, fleet submarines that were over 300 feet long and had airplane hangers on them. Whereas, the US Navy's destroyer force was not training is anti-submarine warfare, but rather using their destroyers surface warfare fighters. These two beginning war strategies did not serve either side well the first year of combat. 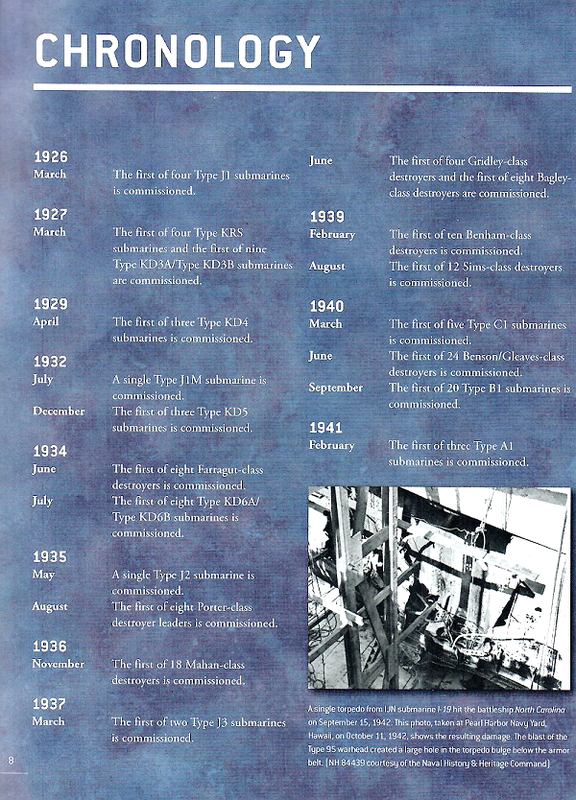 The next section is a two-page chronology starting at March 1926 when Japan commissioned their first large, fleet submarine and ends in November 1942 when their submarines are redirected to haul supplies to isolated Japanese units at Guadalcanal. This is helpful to refer to while reading the rest of the book to understand the development process. There is a 12-page section detailing the design and development of both forces up to the attack on Pearl Harbor. The Japanese were making larger submarines, while the US Navy was limited by the London Naval Treaty of 1930. It got to a point right before the war that the submarines and destroyers were about the same size. The next 20 plus pages list the many different classes of both these vessels with such data as displacement, speed, armament, dimension and crew size. Each class is in chronological order and a beginning paragraph explains how this class changed from the one before and what was improved or removed. 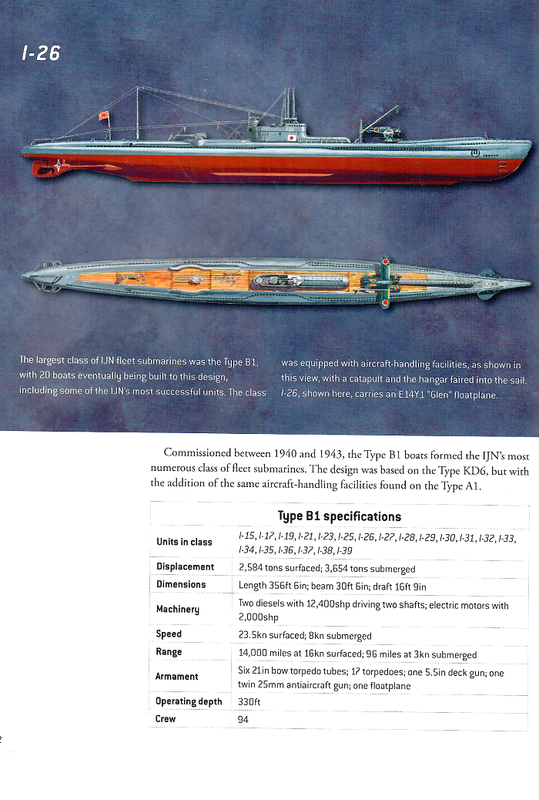 There are some very nice color plates of submarines, destroyers and the weapons they carried to fight each other. About half way into the 80-page book, we get to the combat actions starting with the Pearl Harbor attack. The Japanese has some success this first year by sinking four US Carriers and damaging one more, but that was about all. They never fulfilled their tactic of weakening the US Fleet so their surface sheets could destroy it. The book also examines the failed midget submarine program and how it took submarines away from combat patrolling. One the other side, The US Navy had many problems with their anti-submarine warfare tactics. This allowed some of these carriers to be sunk while under destroyer protection. The book seems to deal with the Japanese side of the fighting more. I believe this is because there is so much written about the US Navy's side of the war, but not a lot about the Imperial Japanese Navy's side. Overall, I enjoyed reading this book and increasing my knowledge of the Japanese submarine force, there are many black and white photos of each class of submarine and destroyer, plus the nice painting of the Yorktown sinking. The interior photos of Japanese submarines are some I have never seen before. The detail photos will help any modeler in researching these boats. I would like to thank Osprey Publishing and IPMS for the opportunity to read and review this interesting naval history book.